We’d love your help. Let us know what’s wrong with this preview of Centaur Rising by Jane Yolen. One night during the Perseid meteor shower, Arianne thinks she sees a shooting star land in the fields surrounding her family's horse farm. About a year later, one of their horses gives birth to a baby centaur. The family has enough attention already as Arianne's six-year-old brother was born with birth defects caused by an experimental drug—the last thing they need is mor One night during the Perseid meteor shower, Arianne thinks she sees a shooting star land in the fields surrounding her family's horse farm. About a year later, one of their horses gives birth to a baby centaur. The family has enough attention already as Arianne's six-year-old brother was born with birth defects caused by an experimental drug—the last thing they need is more scrutiny. But their clients soon start growing suspicious. Just how long is it possible to keep a secret? And what will happen if the world finds out? 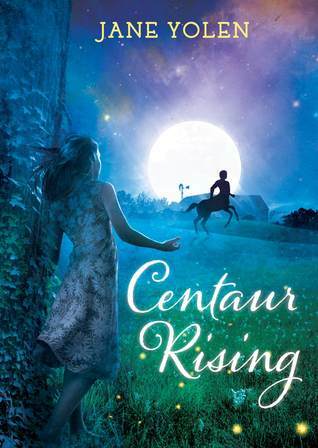 At a time when so many novels are set in other worlds, Jane Yolen imagines what it would be like if a creature from another world came to ours in this thoughtfully written, imaginative novel, Centaur Rising. To ask other readers questions about Centaur Rising, please sign up. Is this a longer version of the story from Half Human? CENTAUR RISING was a sweet story that combined historical fiction with fantasy and a very engaging way. Thirteen-year-old Arianne lives on a horse farm with her mother and her younger brother Robbie. Robbie is six and a thalidomide baby who was born with grave physical deformities. He doesn't have a pelvis his hands which are fused together grow out of his elbows. There is nothing wrong with his brains, though. He is full of six-year-old jokes. They get up in the night one August to watch the Per CENTAUR RISING was a sweet story that combined historical fiction with fantasy and a very engaging way. Thirteen-year-old Arianne lives on a horse farm with her mother and her younger brother Robbie. Robbie is six and a thalidomide baby who was born with grave physical deformities. He doesn't have a pelvis his hands which are fused together grow out of his elbows. There is nothing wrong with his brains, though. He is full of six-year-old jokes. They get up in the night one August to watch the Perseid meteor showers and Arianne sees an unusual flash of light. Some time later they learn that their elderly pony Agora is pregnant. When she gives birth almost a year later, her baby is a centaur. The family and their vet Dr. Herks immediately decide to keep the birth a secret. But secrets have a way of getting out. In the quiet before they do, the family watches the centaur they've named Chiron, but call Kai, grow and learn and bond with them all. Kai quickly grows through the stages of babyhood and toddlerhood. Then he is discovered and many, including the rock star father who abandoned the family after Robbie was born, are eager to exploit him. It takes good planning and lots of love and luck to come up with a way to protect Kai but still give him a purpose. This was a rather sweet kids' book that took me by surprise. I wasn't one of those kids obsessed with horses and horse books and this was sort of a fantasy take on that -- a pony on horse farm in the 60s miraculously gives birth to a Centaur child. The story is largely involved with the small family (mom, daughter, who acts as our first person narrator, and thalidomide son) that owns the farm plus the vet and their one farmhand trying to keep Kai secret and safe followed by the inevitable melee This was a rather sweet kids' book that took me by surprise. I wasn't one of those kids obsessed with horses and horse books and this was sort of a fantasy take on that -- a pony on horse farm in the 60s miraculously gives birth to a Centaur child. The story is largely involved with the small family (mom, daughter, who acts as our first person narrator, and thalidomide son) that owns the farm plus the vet and their one farmhand trying to keep Kai secret and safe followed by the inevitable melee of the secret getting out. I LOVE this book. One of the best I've ever read. I definitely recommend this book for young readers. Centaur Rising is unique from other urban fantasy books I've read in that it explores how an isolated incident of magic will be received by the human world. This is definitely the part that I loved most about the book. From seeing the family's initial reactions to how they dealt with keeping this secret to how they deal with peoples' reactions upon learning their secret. (Because you really can't hide a growing centaur boy forever.) Robbie's reaction is especially precious. Having been homeschoo Centaur Rising is unique from other urban fantasy books I've read in that it explores how an isolated incident of magic will be received by the human world. This is definitely the part that I loved most about the book. From seeing the family's initial reactions to how they dealt with keeping this secret to how they deal with peoples' reactions upon learning their secret. (Because you really can't hide a growing centaur boy forever.) Robbie's reaction is especially precious. Having been homeschooled for most of his life because the other kids at school made fun of his appearance (he's a thalidomide baby), he hasn't really had the chance to socialize with other young boys, and the way he takes to Kai, as they decide to name the centaur, is precious. It's also a great reminder that sometimes we should accept gifts / miracles for what they are instead of questioning them. Another wonderful aspect about the book is that it provides a sketch on how people approach conflict. As more people find out about Kai, more people want to give their opinion on what should be done, providing the breeding grounds for dissension. Even when people seem to be in agreement on the surface, there is a lot of internal conflict as well with everyone struggling with his or her own demons and the adults keeping things from the kids (Arianne is thirteen, Robbie six). This makes it a great book to present to upper MG and younger YA readers because it shows them the different ways that people approach conflict and deal with the problem of keeping a secret. Given the troubles keeping a secret brings Arianne's family, it also raises the question of whether a secret is worth keeping. Is it worth keeping the secret, or would have transparency from the beginning have been better? Despite the great themes in the book, I did have problems with the narration. I always felt like a future Arianne was relaying events to us. While this is case, the narrative distance made it hard to relate to the characters over the course of the story. Arianne the narrator seems to be so busy telling the story that she misses out on chances to explore her feelings in the moment and show us how it feels to be a part of these events. The dialogue also felt forced and the characters weren't well developed. Mostly, the characters were brought in as needed to make a point and disappeared afterwards until they were needed again. This is a missed opportunity to show us how an unusual event influences people. While we definitely see the community coming together, there definitely could have been more to the process. For example, while Mr. Suss is mentioned, we never really see him appear. I would have also liked to see more exploration of the changes in Joey's mother after she finds out about Kai. It's also problematic that Kai, the one upon whom everyone's attention is focused, never really gets a chance to speak for him. Even when he speaks up at the end, it's truly Arianne who makes the bargain in his place. Nevertheless, this is definitely a story meant for younger readers. There are great themes for them to explore in this book, and the unique plot may capture their interest. I recommend this for those who enjoy MG/YA books with a magical feel. Immediate reaction - It was a good enough story just not very special. It might have to do with the Centaur having to be so young - though he ages fast. I also thought Yolen should have done a better job of linking the book to the 1960's. She only mentions thalidomide which might not mean anything to children today. I only had a vauge sense that it was around in the early sixties (thanks to Billy Joel's We Didn't Start The Fire"). Even I was off a bit when the drug thalidomide was used which is t Immediate reaction - It was a good enough story just not very special. I also thought Yolen should have done a better job of linking the book to the 1960's. She only mentions thalidomide which might not mean anything to children today. I only had a vauge sense that it was around in the early sixties (thanks to Billy Joel's We Didn't Start The Fire"). Even I was off a bit when the drug thalidomide was used which is the years 1957-1962. Later in the story there finally a mention of Vietnam. With only two references to the 1960's it was easy to forgot as you were reading when the story took place. It does start with a date 1965 but, I had not remembered this. On the plus side the story has some well drawn characters. I was taken with the solider now vet Dr. Herks who could take control of a situation. I also enjoyed the no nonsense Martha who talked to horses and would stand no nonsense. There is also hanging in the background a father who ran away after Robbie was born (the one affected with thalidomide). Finally thought it is a good enough story. The intended audience would probably enjoy it more and be less picky about it. As for me I have been affected more by other children's books. "I knew this was true magic in our lives at last, and the answer was in the sky." "Martha glared at him with a face that could turn a man to stone." "Martha was no longer standing quietly with the pitchfork by her side. Now it was in her hands, the sharp tines pointing at the throat of a disheveled - looking redheaded man who was backed up against the barn." "Dr. Herks cleared a path to the stall by picking people up and moving, them to one side, but in such a quick and gentle manner, no one had time or reason to complain." Arianne and her family live on a horse farm in the 1960s. Arianne's rock star father abandoned them after her little brother Robbie was born. Robbie is a thalidomide baby with physical disabilities. One night the family goes out to the field to watch the Pleiades and Arianne witnesses a white light jumping in among the horses. Then their old pony Agora becomes pregnant and gives birth to a centaur. The little pony boy, who they name Kai after Chiron, becomes the focus of the family, the stable m Arianne and her family live on a horse farm in the 1960s. Arianne's rock star father abandoned them after her little brother Robbie was born. Robbie is a thalidomide baby with physical disabilities. One night the family goes out to the field to watch the Pleiades and Arianne witnesses a white light jumping in among the horses. Then their old pony Agora becomes pregnant and gives birth to a centaur. The little pony boy, who they name Kai after Chiron, becomes the focus of the family, the stable manager Martha and the vet Dr. Herks. They all pull together to keep Kai safe and away from prying eyes even if it means they lose some of their riders and boarders. Kai is a typical centaur with a horse body and a boy torso and head. He becomes one of the family as he grows at an astonishing rate. Of course no secret this big can stay a secret forever. It is up to the family to figure out how to keep control of the story and to keep Kai safe. I liked this, but didn't love it. The problem was pacing, the things they feared were too easily resolved and too soon and the book fizzled to an end like a dud, not a firecracker. It also felt more than a little preachy. Not a bad book, but not a great one, either. Hace años, una amiga mía y yo estuvimos buscando libros de un campo en concreto: los centauros en la fantasía. Buscábamos una novela que los incluyera como elemento principal y, aparte de Harry Potter, poco se salía de la norma de las novelas románticas. Hasta que apareció Centaur Rising, de Jane Yolen, una autora que desconocía por completo. En España, Ediciones B publicó en la década de 1990 las dos primeras partes de su trilogía Great Alta: Hermana luz, hermana sombra y Blanca Jenna, además de Hace años, una amiga mía y yo estuvimos buscando libros de un campo en concreto: los centauros en la fantasía. Buscábamos una novela que los incluyera como elemento principal y, aparte de Harry Potter, poco se salía de la norma de las novelas románticas. Hasta que apareció Centaur Rising, de Jane Yolen, una autora que desconocía por completo. En España, Ediciones B publicó en la década de 1990 las dos primeras partes de su trilogía Great Alta: Hermana luz, hermana sombra y Blanca Jenna, además de algunos relatos. Sin embargo, en el mercado anglosajón Yolen es bien conocida. Ha sido premiada en dos ocasiones con el premio Nébula y en 2017 se le concedió el Grand Master Damon Knight Memorial, un premio muy prestigioso de la asociación de escritores de ciencia ficción de América (SFWA) y que ha sido otorgado a Ursula K. Le Guin, Anne McCaffrey, C. J. Cherryh, Connie Willis y Andre Norton, entre otros señores bien conocidos. A caballo entre el middle grade, las obras consideradas para niños de entre 9 y 12 años, y el young adult, pues su protagonista tiene 13 años, Centaur Rising es quizás una de las obras más disponibles hoy en día de la autora. Hacía mucho tiempo que no leía obras de este rango de edad y esta ha sido una grata sorpresa. Desarrollada a partir de un relato llamado “Centaur Field” (“Campo de centauros”), la novela nos descubre en el prólogo a una joven solitaria de 13 años, Arianne, que en una lluvia de estrellas en 1964 ve cómo una de las luces cae cerca de su granja. Meses después, una de los ponis da a luz a un potro medio humano, medio caballo, liminal entre dos mundos muy diferentes. Ari y su familia deciden cuidar al centauro y mantenerlo en secreto para evitar el rechazo de la comunidad en la que viven, pero guardar un secreto así de grande no será nada fácil, como veremos a lo largo de la obra. Jane Yolen uses a clever technique in her novel Centaur Rising by subtly incorporating tads of history in this fantasy. A young mare gives birth to a centaur, who is half horse and half boy after being exposed to a meteor shower. The mother’s pregnancy baffles the family because this young mare had not mated to their knowledge. The mother Hannah, her daughter Ari and son, Robbie work on getting to know the young centaur, Kai and spend most of their time trying to shield him from outsiders. They Jane Yolen uses a clever technique in her novel Centaur Rising by subtly incorporating tads of history in this fantasy. A young mare gives birth to a centaur, who is half horse and half boy after being exposed to a meteor shower. The mother’s pregnancy baffles the family because this young mare had not mated to their knowledge. The mother Hannah, her daughter Ari and son, Robbie work on getting to know the young centaur, Kai and spend most of their time trying to shield him from outsiders. They fear for his safety, so they put their horse business on hold to keep neighbors and customers from coming to the farm. But there are leaks to the press, yet Kai is ultimately accepted, and his mission is made quite clear. Young Robbie is always in a wheelchair because he has what was called thalidomide disease. In the 50’s and 60’s, pregnant mothers were being given this drug for morning disease. It caused severe deformity in many children and they had cleft hands and the appearance of a seal. The father had abandoned the family because he could not accept what had happened to his son. As Kai grows stronger, he is rented out to give children like Robbie rides and offer them horse therapy. It has been used for years in many countries for children with disabilities as it offers them a sense of empowerment. Towards the end of the book Kai’s father, a mythical centaur god, Chiron comes from heaven to tell him that it is time for him to come home. He has been sent on loan to help Robbie and other children like him heal and grow stronger. But is Kai ready to leave his earthly family? Is his newly-found family ready to part with this wonderful creature? Read Centaur Rising and see how this page turner ends! How do you handle a miracle? How would you handle a mythical creature not of this world who is born in your backyard? Stories abound of humans who come in contact with the ethereal; many do not end well. When a centaur is born to a family rife with problems, hard decisions have to be made. This is a family who loves each other fiercely, although the nature of that love varies from one person to the next. All of the characters are limned out, from the practical and stolid Martha who loves horses mo How do you handle a miracle? How would you handle a mythical creature not of this world who is born in your backyard? This is a family who loves each other fiercely, although the nature of that love varies from one person to the next. All of the characters are limned out, from the practical and stolid Martha who loves horses more than people to Garry Herk, a veterinarian who was also in the war. They rally around a newborn centaur who they name Kai and try to keep him safe, happy and protected while dealing with nosy neighbors, intruding news reporters and a sleazy ex-husband. Kai is a happy child, whose existence is one that many children can only dream of and envy. The others try to shelter him without making him spoiled or fearful. He sees no difference between his dam Agora and his human mothers and is equally joyful about the parts that make him boy and horse without wishing that he was one or the other. This is definitely a book for young readers. But I think older children will enjoy it as well for its dexterous meshing of the mundane and the magical. Once the others stop trying to name what Kai is and merely accept him, the reader accepts him, too. The ending of his story is surprising and awe-ful (no, that’s not a misspelling on my part) and it speaks to the secret yearning in the bosom of many young and not-so-young readers. There is magic about the world and occasionally it reaches out for us. A sweet tale of a Centaur born on a struggling horse farm. A piece for middle grade readers, it is a quick read, with characters who are fairly simple. Really sweet, magical little story about how our disabilities and differences make us beautiful and unique. I loved it. This was a very fun story. How in the world could a family have a centaur born on their farm and keep it a secret? Yolen makes this impossible event work and tells an enjoyable story. Shows how people will support what people call "abnormal" "weird", etc. Reseña de Centaur Rising en La Nave Invisible . Centaur Rising is a middle grade to young adult novel by Jane Yolen. Arianne has always wished for magic in her life, a meteor shower and some team work might just make that reality. During the Perseid meteor shower, Arianne thinks she sees a shooting star land in the fields surrounding her family’s horse farm. About a year later, one of their horses gives birth to a baby centaur. The family wants to protect the young boy and has had enough attention already. Arianne’s six-year-old brother was b Centaur Rising is a middle grade to young adult novel by Jane Yolen. Arianne has always wished for magic in her life, a meteor shower and some team work might just make that reality. During the Perseid meteor shower, Arianne thinks she sees a shooting star land in the fields surrounding her family’s horse farm. About a year later, one of their horses gives birth to a baby centaur. The family wants to protect the young boy and has had enough attention already. Arianne’s six-year-old brother was born with birth defects caused by an experimental drug, and their rock-star father has deserted them. They do not want the limelight, but soon the horse farm’s clients growing suspicious. How long can they keep their secret and everyone safe? What will happen if the world learns about the miracle on the farm? Centaur Rising keeps with the record of Yolan never disappointing me. I really enjoyed the characters, the setting, and the premise. Arianne is a girl that has grown up faster than she should, and is still both compassionate and weary. Her father left the family when her younger brother was born with birth defects. Her outlook was realistic with still a wistful hope for magic and better things. I loved her younger brother’s determination and resilience, and her mothers efforts to protect them both. I will say that my favorite character is still Martha, a employee that is more of a family member on the horse farm. I think that the description of the centaur foal and his development was key to the story. It kept the wonder of his very existence, but also dealt with the practicalities and truth that made him much more human and real than most people here in reality, This is much more than a fantasy, more than a coming of age story, this is a look at how real people facing extraordinary circumstances still have to keep moving forward and dealing with the minute details that are often left out of books and television. I also have to say that I got a bit of a kick out of the fact that the farm where this all takes place just happens to be right here in Connecticut. I really enjoyed Centaur Rising. Yolan, as usual, brings her characters to life. She leaves readers with a feeling that this family, this farm, could really be out there somewhere. Her characters are so real. Like in real life, there are funny moments, moments that make you want to scream, and moments that make it all worth while. Built off the backbone of a short story first published in Bruce Coville's collection Half-Human, Yolen has fleshed out the original story into a full middle-grade novel. I was very pleased to see this, as I thoroughly enjoyed Half-Human and "Centaur Field" was one of the better stories in it. Most things about the story are the same, but the setting is more firmly grounded in the mid-1960s, main character Arianne's baby brother who died at birth survived in this version but with severe birth de Built off the backbone of a short story first published in Bruce Coville's collection Half-Human, Yolen has fleshed out the original story into a full middle-grade novel. I was very pleased to see this, as I thoroughly enjoyed Half-Human and "Centaur Field" was one of the better stories in it. Most things about the story are the same, but the setting is more firmly grounded in the mid-1960s, main character Arianne's baby brother who died at birth survived in this version but with severe birth defects from thalidomide, and the kids' estranged father actually shows up. Everything else has been rounded out and given more detail. The book explores some pretty profound themes about family and acceptance of difference. Arianne's feelings of being caught between adulthood and childhood I think will resonate with its target audience of preteens and young teenagers. The family struggles with shielding its two unusual members--severely handicapped Robbie and baby centaur Kai--from the world and how to transition them into it when they realize they can't keep the world at bay forever. Arianne and Robbie also have to deal with realizing that their birth father is an awful person who cares only for himself--a difficult lesson for any child with a narcissistic parent from whom they want love that will never be given. Luckily the two children are supported by other adults who do love them unconditionally: their mother, barn hand and horse whisperer Martha, and local vet Dr. Herks. Centaur Rising is a middle grade to young adult novel by Jane Yolen. It is currently scheduled for release on October 21, 2014. Arianne has always wished for magic in her life, a meteor shower and some team work might just make that reality. During the Perseid meteor shower, Arianne thinks she sees a shooting star land in the fields surrounding her family’s horse farm. About a year later, one of their horses gives birth to a baby centaur. The family wants to protect the young boy and has had enough attention already. Arianne’s six-year-old brother was born with birth defects caused by an experimental drug, and their rock-star father has deserted them. They do not want the limelight, but soon the horse farm's clients growing suspicious. How long can they keep their secret and everyone safe? What will happen if the world learns about the miracle on the farm? Centaur Rising keeps with the record of Yolan never disappointing me. I really enjoyed the characters, the setting, and the premise. Arianne is a girl that has grown up faster than she should, and is still both compassionate and weary. Her father left the family when her younger brother was born with birth defects. Her outlook was realistic with still a wistful hope for magic and better things. I loved her younger brother's determination and resilience, and her mothers efforts to protect them both. I will say that my favorite character is still Martha, a employee that is more of a family member on the horse farm. I think that the description of the centaur foal and his development was key to the story. It kept the wonder of his very existence, but also dealt with the practicalities and truth that made him much more human and real than most people here in reality, This is much more than a fantasy, more than a coming of age story, this is a look at how real people facing extraordinary circumstances still have to keep moving forward and dealing with the minute details that are often left out of books and television. I loved how the time period did not overshadow the overarching theme of disability and belonging. I had no idea there was a time of panic over an experimental drug that had disastrous effects on the baby. Yolen's notes were so interesting that I did some general informative research to better familiarize myself with learning about Thalidomide children. No child will dwell on that part. The book barely touches it, I just of course had to figure out the logistics of centaurs procreating in the world----because magical science is important. I'm not sure how I got stuck on that fact, I think since the pregnancy seemed like a "miracle" and the birthing process of a human-horse child aspects were mentioned, which allowed me to take my nonsense one step further. What I love about children's books are the black and white contrasts of good and bad characters. I also love the magical neatly tied endings of making more of the impossible happen by (view spoiler)[bargaining with the centaur to have the baby centaur stay (hide spoiler)] Ahhhh! The magical quality of children's literature. Arianne and her brother, Robby, were just ADORBS! The secondary characters were lovable, the plot, pacing, and historical tidbits were engaging and this book would have crossover appeal. Arianne is a girl who lives on a horse farm with her mother and brother, Robbie. During the Perseid meteor showers one summer their pony got pregnant. Only it was with something other than a horse. Because when 11 months later the little filly was born it wasn’t a pony…it was a centaur. Of course Ari and her family must hide the fact that a centaur lives in their barn (how many scientists or zoos or reporters would love to exploit a baby centaur) but that proves to be a little harder than expect Arianne is a girl who lives on a horse farm with her mother and brother, Robbie. During the Perseid meteor showers one summer their pony got pregnant. Only it was with something other than a horse. Because when 11 months later the little filly was born it wasn’t a pony…it was a centaur. Of course Ari and her family must hide the fact that a centaur lives in their barn (how many scientists or zoos or reporters would love to exploit a baby centaur) but that proves to be a little harder than expected. Especially since Ari’s family is poor and rents out space on their farm for boarding horses and also teaches horse riding lessons. With all those extra people coming to the barn on a regular basis it proves to be just about impossible to keep any horse secrets. I'm not sure I will ever be a full-fledged fantasy reader, but clearly my Fumbling Through Fantasy project has at least weakened my resistance a little bit, because I willingly borrowed a fantasy novel from the library! In Centaur Rising, Jane Yolen tells the story of a 1960s family whose lives are forever changed when their horse gives birth to a centaur. Arianne and her six-year-old brother, Robbie, already have their share of problems, as Robbie is a thalidomide baby, with the accompanying ph I'm not sure I will ever be a full-fledged fantasy reader, but clearly my Fumbling Through Fantasy project has at least weakened my resistance a little bit, because I willingly borrowed a fantasy novel from the library! In Centaur Rising, Jane Yolen tells the story of a 1960s family whose lives are forever changed when their horse gives birth to a centaur. Arianne and her six-year-old brother, Robbie, already have their share of problems, as Robbie is a thalidomide baby, with the accompanying physical deformities, and their father left the family rather than face his child's disabilities. When the centaur, whom they name Kai, arrives after the Perseid meteor shower, the kids and their mom, along with the veterinarian, and Martha, who helps care for the horses, decided to keep him a secret in order to protect him and their own privacy, but it quickly becomes clear that it's only a matter of time before the truth comes out. In the end, Robbie, who bonds with Kai like a brother, is the inspiration for how Kai will ultimately fit into their world. The baby centaur sends Ari’s life into chaos. But it also causes great changes to the insular life Ari has led since her brother was born. Arianne experiences a rare occurrence of family togetherness on the night of the Perseid meteor shower. As Arianne, her mother, and her brother lie on blankets in the pasture, their old pony comes to join them. The pony goes running off when one of the shooting stars seems to come to Earth, and a year later that old pony becomes the mother of a mythical beast. Centaur Rising is the story of a struggling horse farm that gets a big injection of magic when one of the ponies gives birth to a centaur. While I didn't love this book, I did find it interesting and will likely be passing it on to my horse-crazy nieces. Fair warning that, for a book aimed at 8-12 year olds, this one has some heavy stuff. First of all, our main character Arianne's little brother Robbie is severely handicapped, since his mother had take Thalidomide. But I liked that his handicap d Centaur Rising is the story of a struggling horse farm that gets a big injection of magic when one of the ponies gives birth to a centaur. While I didn't love this book, I did find it interesting and will likely be passing it on to my horse-crazy nieces. I can't quite put my finger on why I didn't end up loving this one. I think it might have to do with the fact that the main character Arianne (and the tone of the book in general) was very serious. But beyond that, I can't say why I wasn't crazy about this one. I also found the very end pretty bizarre. But this book is about a centaur birthed through the immaculate conception of a pony, so I guess that's not surprising. Maybe I just like my books to be either fantasy or contemporary and this one was neither (magical realism?). Centuar Rising was the first novel that I have read by Jane Yolen. The book is about a girl named Arianne who has a disabled brother (Robbie) and a single mother. One day, a centaur is born on their farm. The centaur poses a threat to the farm but is a therapeutic aid for the previously-bullied Robbie and for Arianne, who is trying to find her happy place with her distant mother and aggravating brother. Will the centaur be found? Or will this troubled family keep the joy of the centaur to themse Centuar Rising was the first novel that I have read by Jane Yolen. The book is about a girl named Arianne who has a disabled brother (Robbie) and a single mother. One day, a centaur is born on their farm. The centaur poses a threat to the farm but is a therapeutic aid for the previously-bullied Robbie and for Arianne, who is trying to find her happy place with her distant mother and aggravating brother. Will the centaur be found? Or will this troubled family keep the joy of the centaur to themselves? This book was a quick read that I thought was okay. It had many internal meanings. This includes the fact that Arianne's brother was a thalidomide baby, which is a birth defect that has numerous effects, including being born with 2 legs born together. This is a struggle for Arianne's whole family, as there is much criticism toward them. They now have another "problem" to conquer in the family, not to mention the father that left after Robbie was born. But sometimes the book got kindof boring and extremely dragged out. Arianne’s family is scraping a living out of their ranch. Her mother is stressed, as she attempts to please difficult owners who board horses with them and bring their children for riding lessons. Her brother, afflicted with birth defects, is a sweet-tempered, homeschooled child, who can’t help with the endless chores that a horse farm generates. When one of their horses gives birth to a centaur, Arianne is not certain if it is a blessing or a curse. Arianne’s family tries to keep the centaur a s Arianne’s family is scraping a living out of their ranch. Her mother is stressed, as she attempts to please difficult owners who board horses with them and bring their children for riding lessons. Her brother, afflicted with birth defects, is a sweet-tempered, homeschooled child, who can’t help with the endless chores that a horse farm generates. When one of their horses gives birth to a centaur, Arianne is not certain if it is a blessing or a curse. Arianne’s family tries to keep the centaur a secret, reasoning that he should not be treated like a sideshow attraction (possibly prompted by the cruel behavior people exhibited to her brother’s birth defects in the past). Of course, the secret is exposed and the family must deal with the curious, the cruel, and the exploiters. However, the situation also cements family ties and encourages the local veterinarian to (finally) propose to Arianne’s mother.